How many lines of code it takes to convert Hex to Assembly? only FIVE Thanks to Python and Capstone!. 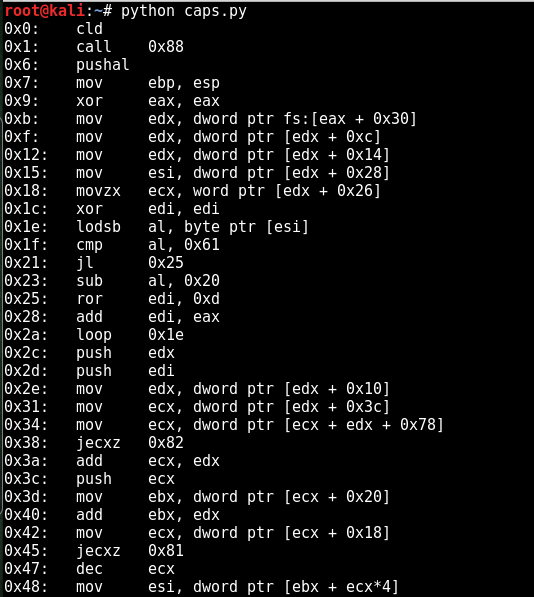 During binary analysis, exploit development or reverse engineering you require a quick dissembling of hex shellcode to assembly. You could do that using a dissembler like Ollydbg or IDA Pro, if you don’t want to use a full fledged dissembler to perform this small task the following code will help to convert hex to assembly using simple python script. Download and install using the following command. Note that in Kali Linux it is already there. For windows download the following MSI files and install using the GUI wizard.